Crazy smart guys at Berkeley have created the world’s smallest radio. How small? Tiny. Hey, actually this website is appropriately named to give this story the coverage it deserves. 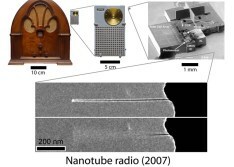 The radio is invisible to the naked eye, being composed of carbon nanotubes only 10 nanometers in diameter and a few hundred long. Because of the unique qualities of these tubes, namely their strength, electrical conductivity, and ability to vibrate really fast, the folks at Berkeley were able to train one to act as an antenna, tuner, & amplifier. Plus, it demodulates AM and FM. Though switching channels isn’t as easy as turning the dial, it doesn’t sound like making it so is far away.